i wasn't necessarily shocked when i received news about the remote possibility that my nalgene lexan bottles might leach toxic chemicals to the liquids that i store in them. i have been using nalgene bottles since 2004, and since then, have owned more than 10 bottles in total. i've lost a few, either due to carelessness or theft, but continue to retain about 6 or 7. they are as tough as legend says they are, and i have dropped them onto concrete floors, whether with intention or accidentally, and they've bounced back with only a few scratches. so i decided to keep them even though as soon as news came out, nalgene decided to clear out north american stores stocked with its lexan bottles (which also makes me wonder whether asia would be dumped with all these suspect bottles). besides, i've always known that western scientists are always paranoid about these things, and they tend to blow things out of proportion. there are a lot of toxic things out there, and the levels of my exposure should probably have reduced the size of my brain to that of a nut, or impeded my speech, or induced at least 5 types of cancer. but i'm still very healthy, by my standards, so although i haven't completely ignored these warnings, i'm cautious about which to believe, and the degree of my belief. 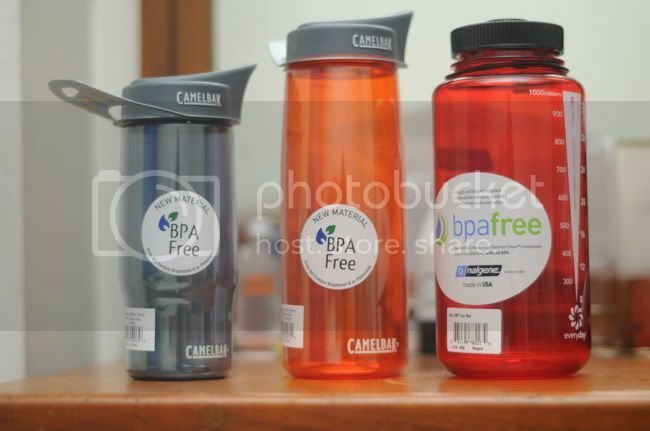 but, lo and behold, i got myself a set of non-lexan, BPA-free bottles, courtesy of jonathan. haha. me and my beliefs. i may not think that my lexan bottles are going to kill me, but then again, i can't wait to poke fun at others and the chemicals they introduce into their bodies each time they drink from their nalgenes. i walked into ROX over a week ago and asked the attendant if they carried non-BPA bottles. he gave me a quizzical look and proceeded to introduce me to this stack of nalgenes. i really think that ROX should hire people who are mountaineers, or are at least familiar with the sport. and there should be some sort of continuing education so they don't come off as stupid of ill-informed when real outdoorsy folks come in to buy stuff. pictured above are 3 bottles: a 16oz gray and 25oz tangerine camelback better bottle, and a 32oz lollipop red tritan nalgene bottle. not included is the .85L bilt fresco stainless steel bottle (which has a smaller carbon footprint compared to aluminum bottles). so what am i going to do with all my nalgenes? i'm still keeping them. if not to store anything i'd imbibe without trepidation, they'd serve a purpose or some other.